Emily Miceli of Girl Scout Troop 170 was last year's winner. LAKEWOOD, NJ - The BlueClaws are once again looking for area boy and girl scouts to design the patch given out by the BlueClaws to scouts at BlueClaws scout nights this year. Submissions will be accepted until March 23rd. The BlueClaws will choose the finalists and voting will occur on the BlueClaws official Facebook page or via email at scouts@blueclaws.com until March 30th at noon. 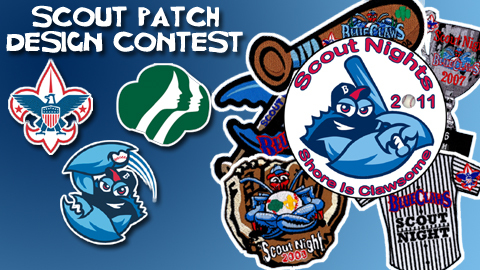 The winning scout will receive a ceremonial first pitch at their scout night in 2012, a meet and greet with a BlueClaws player, and, of course, have their patch be given out to the approximately 5,000 scouts that come out to the park this summer. Interested scouts can download this form (click here) and fill in the circle, using 10 colors or less. The BlueClaws will adjust the patches with the proper logos. Forms must include the name of their scout pack or troop as well as the name of the scout. Scouts that enter must be a member of a pack or troop that has booked their 2012 BlueClaws outing. The BlueClaws will host five Scout Nights in 2012, two of which (July 28th and August 11th) are Scout Night Sleepovers, where scouts camp out on the field after the game. Last year's winner, shown above, was Emily Miceli of Girl Scout Troop 170. For information on bringing a scout group to FirstEnergy Park, call Pete Walsifer at 732-901-7000 ext 171 or visit BlueClaws.com/scouts. The BlueClaws have led the South Atlantic League in attendance in all 11 years of existence and this year will become the fastest team in New Jersey and SAL history to reach 5-million fans. Ticket packages and group outings for the upcoming season are available by calling 732-901-7000 or online at BlueClaws.com.